Owode-Yewa town in Yewa South Local Government Area of Ogun State is one of the communities very close to the border town of Idi-Iroko, with a border post separating Nigeria from the Republic of Benin. With its location, the town is a commercial centre where international businesses take place. Cross border trades such as selling of foreign used automobiles, imported rice, wines and other products, also flourishes. Most youths in the town engage in commercial activities courtesy of the international route. As a result, operatives of the Nigerian Customs Service (NCS), always patrol the town for contraband, particularly foreign rice and vehicles smuggled into the country. Though men and officers of the NCS have had brushes with suspected smugglers in this bubbly town, but the encounter between the Customs and youth of the town on Monday, January 21, left the residents of the town in mourning, agony and gnashing of teeth. The town, as usual, had woken up to the normal hustle and bustle, till around 12.45p.m, when anti-smuggling squad led by one officer identified as Jamari, stormed the town and headed to a residential building located very close to a church, at Elekute, to evacuate bags of imported rice, allegedly stored on the premises of the building. Apparently prepared to carry out their mission without any hindrance, the NCS operatives were reported to have started shooting sporadically and in the process, bullets hit two private school buildings and several other buildings in the vicinity. A resident who witnessed the incident but craved anonymity, told Daily Sun that a van belonging to one of the private schools was riddled with bullets and badly damaged. He added that several spent bullet cases were found on the premises of the school, while some residents sustained serious gunshot injuries. The youth who became infuriated by the actions of the customs operatives, however, confronted them. 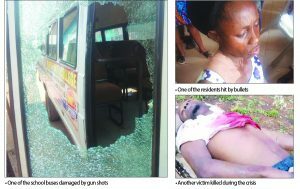 And in the melee that followed, no fewer that three persons, Jamiu Bello, 32, Taiwo Oni, 41 and Taiwo Adeleye, 38, were felled by the bullets of the men of the NCS. “They came into the town around quarter-to-one in the afternoon and headed to Elekute area, shooting sporadically to the extent that the bullets hit two private schools and several buildings. One of the private schools, Majesty Schools, had its van riddled with bullets and badly damaged. When the dust settled after the incident, several pellets of bullets were found on the ground. And many were seriously injured. “And apart from the three people who were shot dead, we later gathered that two others were killed but were buried without the community knowledge. Our town was thrown into serious mourning because of these young men cut down in their prime. Another youth, Bisi Adio, condemned the killing and accused the NCS of murder. He noted that the youth challenged the team on why it wanted to raid a private building, saying the way the defenceless youth were killed was tantamount to barbarism. But the Public Relations Officer of the Ogun Command of NCS, Abdullahi Maiwada, claimed that some smugglers and their accomplices had ganged up to prevent the anti-smuggling team from carrying out its legitimate duty: “At about 1200 hours of Monday afternoon January 21, 2019, some smugglers and their accomplices ganged-up against an anti-smuggling team from discharging its legitimate functions at Owode (Yewa) community. “The officers who went on an operation to save Nigerian economy from the mayhem of smugglers who stocked a place of worship and some houses nearby with rice, suspected to have been smuggled into Nigeria, faced stiff resistance from some armed criminals, inflicting serious injuries on two officers and minor injuries on other members of the team. “They further destroyed official patrol vehicles. The encounter led to exchange of fire between officers and smugglers with their accomplices. For peace to reign, the team resorted to tactical withdrawal. “However, the hoodlums took law into their hands by barricading the main road leading to Idiroko, scouting for customs officers to attack. They also battled with law enforcement agencies to gain access to customs formations for further confrontation. “It is saddening. We have laws in this country and it is stated clearly that even when someone commits an offence, the customs could arrest the person, hand him or her over to the police, then the person would be charged to court. It is only the court that could convict such a person. Akinlade, who is currently House of Representatives member representing Yewa South/Ipokia in National Assembly, recalled how he raised a motion concerning similar incident which happened in Oke Odan, last year and how justice has been delayed till date. He said he would take a different approach this time, as he would lead a protest to the offices of the NCS in Idiroko, to raise global awareness on the issue of the incessant killings: “This will make the necessary authority take charge of the situation. “There is a border in Idiroko and that is where we will go. It will be a peaceful protest, we will go there and sit. We will not block the road or take any swipe at them. We will choose a day all of us will go there. We will wear black and conduct ourselves in a peaceful manner to protest these killings. “I find this saddening and unacceptable that this has to happen to our people. The men of the NCS have acted in utmost bad faith even while enforcing their constitutional duties. While I do not support the flouting of government rules as it relates to contrabands and prohibited goods by anyone, the agency must go about its duties with respect for the dignity and sanctity of human lives. He called for reforms of enforcement operations by the customs and urged the appropriate authorities to investigate the dastardly act and ensure justice for those affected. Isiaka also counselled the youths not take laws into their hands but allow the security agencies wade into the matter and prayed for the repose of the departed souls and the fortitude for their families to bear the huge losses. The Olu Owode-in-Council demanded justice in a seven-point communiqué. “The families of the deceased be adequately compensated as they all left wives and children behind; the hospital bills of those injured be paid fully and the shops and the vehicles damaged be repaired fully.